After the sugar rush and candy binge of Halloween, we could all use lighter fare to give our systems some much needed nourishment. We’ve already established my love of all things cilantro and lime, and today I’ve got two more incredible recipes highlighting this perfect pair. I’m pretty sure we’ve also established my complete and total obsession with Pinterest, which is where I found these delightful recipes for Mustard-Lime Chicken and Cilantro-Lime Vinaigrette. I pinned them immediately and couldn’t wait to make them. And now these recipes have both migrated from my “Cook” Pinterest folder to the “Tried and True” one. I know I’ve already posted Cilantro-Lime Chicken, but this Mustard-Lime Chicken from Elana’s Pantry is even better. The simple addition of mustard deepens the flavor tenfold. And although the original recipe called for marinating the chicken 15 minutes to six hours, I left it in the fridge overnight and would do it again. Rather than grilling the chicken I baked it until cooked through. It was tender and flavorful, with a texture resembling chicken tikka. The next day, I served the leftover chicken tenders over a salad and topped it with this silky cilantro-lime dressing. Kate over at Our Best Bites says that in addition to being great on salads, it also works wonders as a marinade for chicken or fish (she uses this as the basis for her fish tacos). I believe it. But back to this dressing. It’s everything you could want in a vinaigrette: it’s light but has good body so coats the salad nicely, and the flavor is perfectly balanced with just the right amount of acidity to make your tongue dance. I should also note that I made this recipe when limes were still available in Israel. Although the short lime season has come and gone I stocked up by juicing a few kilos of limes and freezing the juice in ice cube trays. I couldn’t face another nine months without lime juice in my life. What can I say? Those of you in the rest of the world probably don’t have this problem. These two recipes are great separately or together, for lunch or for dinner. Both can be made ahead, which makes them great for weeknights or even entertaining. Put the lime juice, cilantro, mustard, olive oil, chili, salt, and pepper in a food processor and pulse until well combined. Put the chicken in a large bowl. Pour marinade over chicken, cover and refrigerate for at least 1 hour or overnight. Put chicken on a baking sheet, being careful not to crowd the pan. Bake until cooked through, flipping midway, about 20 minutes. Taste and season. Store in the refrigerator, up to one week. Nice! I have both cilantro and lime at home. Limes disappeared from the shook here a few weeks ago, I’m so glad I recently stocked up! I will be using them very stingily. Does the frozen lime juice really keep well, without developing freezer tastes? Excellent! So far so good on the frozen lime juice. It’s been less than a month so I can’t say how great it will do in the long run, but I froze it in ice cube trays and just take out a cube or two whenever I need. 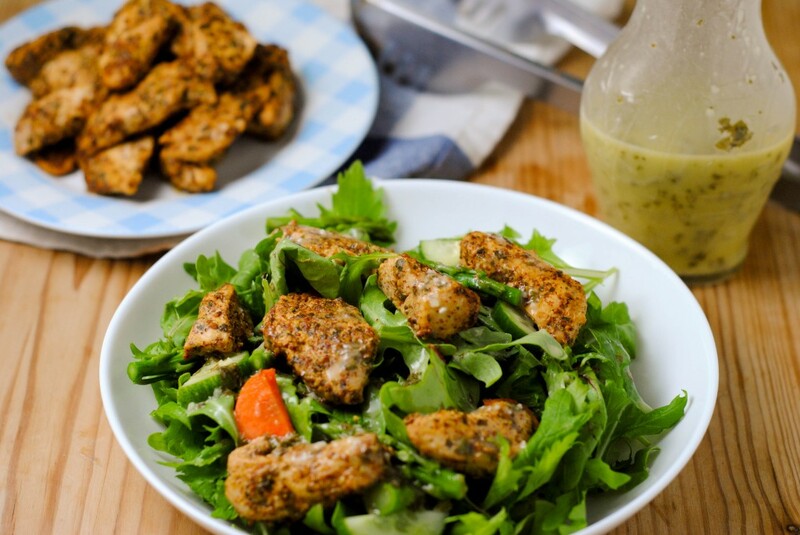 A beautiful meal… the chicken looks perfectly at home nestled in that fresh green salad! Thank you! It definitely made for a great salad! Yeah, lime & cilantro do it for me, too. I often marinade chicken before grilling, and this is a nice way t do it. And I really like the vinaigrette. Thanks! I just can’t get enough cilantro and lime! The addition of mustard really worked well in both cases as well. So glad you like it! Hello Katherine, I think I can smell this recipe from here! Great Combination! Today I’m making the vinaigrette, too bad we had our chicken yesterday..
Haha thank you Eri!! So glad you like it 😀 And I hope you enjoy the vinaigrette! Oh yay! I hope you enjoy!! And thanks for the tip about preserving limes in salt – I’ve had lemons done this way but never limes! I will have to try it next year when lime season is upon us again! Mustard has been showing up a lot in recipes, but it works really well on chicken as well as pork. Also flavoring chicken with chicken gives it an amazing taste. Anyhow I have saved this recipe and I have noticed that limes are getting scarce, but I do still have my bottle of Nelly and Joes key lime juice. Thanks for sharing, I have saved this recipe-yum! I love what mustard adds to dishes, from meat to marinades and vinaigrettes. You’re right, it’s also amazing on pork! I also have bottled lime juice I brought back from the states in case of emergency. I hope you make the recipe and enjoy!! Mustard has been showing up a lot in recipes, but it works really well on chicken as well as pork. Also flavoring chicken with chicken gives it an amazing taste. Anyhow I have saved this recipe and I have noticed that limes are getting scarce, but I do still have my bottle of Nelly and Joes key lime juice. Thanks for sharing. This looks absolutely, positively delicious! I’m a fan of anything cilantro-lime too! Mustard is a new “like” that is growing on me, so I thin this will be a good recipe to try my mustard taste buds on! Thanks for a great recipe! Thank you Maggie! I must tell you that I only grew to like mustard in the past few years and I still am not crazy about it as a straight-up condiment. But I love it in this! The mustard flavor really mellows and just works perfectly with everything else. And in the dressing it really acts more as a thickening agent than anything else. I hope you enjoy!! Okay, this one is a must try for me. Love mustard, love lime, love cilantro. It all looks so good! What a fantastic looking salad! Can’t say much about the marinade except for “awesome”! Got to try it! Thank you!! Let me know how you like it if you do give it a try! Packed with flavor, the dressing sounds perfect! As usual, a drool-worthy post. Your blog has become the place where I go to get inspired to cook new and exciting things. You rock. My Middle Eastern husband thanks you for this incredible recipe with this great combination of flavors. He eats everything, I mean everything with lime; Cilantro is his second runner up. As always your photography is so appealing and your write up inviting. I love your blog! This is gorgeous! I can’t wait to try this vinaigrette. I’m happy you stocked up on lime juice…9 months is way too long to wait for more! Thanks Hannah!! Yes, I learned my lesson about lime juice last year – you can’t even get it bottled here! Now whenever I need it, I just pluck a lime ice cube from my freezer. I’m thinking they’ll be really good in gin and tonics too! This is such a beautiful dish. Congrats on top 9! This combines some of my very favorite flavors, plus it looks wonderfully healthy and wholesome. Wonderful! Thanks, and congratulations on the Top 9 feature! Thank you Kiri! It combines some of my favorite flavors as well 😀 I think I could eat this for dinner every night! My hubby hate mustard so I can’t cook with it much, but this looks really delicious to me. Congrats on Top 9! Ooo — I want to make this for lunch! A double dose of lime and cilantro, plus mustard and vinegar. We have a new lime tree, living in California, and winter is citrus season. Yum. I hope you enjoy it! Mmm, I bet vinegar would make an excellent addition. So jealous of your lime tree!! This looks really refreshing. I am always on the look out for new things to do with chicken. Thanks! Thanks Nami!! 😀 Haha I’m so glad you like it, and that your meat eater husband would too! This chicken recipe is making my mouth water! Thanks so much for sharing it. My husband and I are trying to eat a little healthier, and this recipe will definitely spice up our weekly dinners! I’m so glad you like it Lauren 😀 I’ve been trying to eat healthier as well, and this definitely fits the bill! Great vinegarette . I used it on a blackened chicken salad. Wow,, this is a must for me to try. Gonna print the ingredients. Looks so yummy. You should adopt me! I hope you enjoy it! If you move to Israel I’ll happily adopt you :-p Otherwise will have to wait a few years until I’m back in New York.